West Bridgford church. East end of chancel. 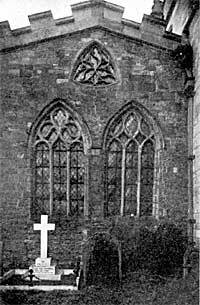 The remains of a fenestella in the south wall denotes that the aisle was screened to form a chantry chapel, and although not a vestige of the parclose remains, there is a groove in the stonework to shew where it once stood. This double fenestella, now but a remnant of its pristine state, was a beautiful feature, having the bason of the piscina in one compartment and a credence or shelf for altar vessels in the other, with a quatrefoil pierced between the arches. A stone altar, which formerly stood here, with its back edge built into the eastern wall, was ruthlessly torn away at the Reformation, and when last heard of, it was doing duty as a paving stone in the floor of the chancel. The high altar shared a similar fate, but an oak Communion table, which replaced the stone altar in Elizabeth's reign, is still in use in this side chapel. I have searched in vain for any information concerning the dedication of this side altar, but as the parish church was dedicated in honour of St. Giles, it may be assumed that this subsidiary altar would be in honour of Our Lady. From the 12th century onwards, hundreds of parish churches set apart one of their altars to the Virgin, so that now there are no fewer than 2335 altars under one or other of the various forms of dedication; to "Our Lady of Pity," "Our Lady of Sorrow," "Our Lady of Grace," &c., &c.; and further, it should be noted that one of the ancient bells in the tower, the "Angelus" of pre-Reformation days, inscribed with the words AVE • MRIA (Hail Mary), is probably the bell which was sounded when Mass was celebrated at this particular altar. St. Giles became the Patron of Cripples because he himself was lame. Traditions concerning him are somewhat vague and uncertain. He appears to have lived the life of a hermit in one of the deserts near the mouth of the Rhone, where, one day, a hind, which yielded him milk, was chased by Royal hunters right into the mouth of his cave. An arrow, shot at the fugitive hind stuck in the flesh of the hermit1 and made him lame for life. St. Giles became a popular saint, so much so, that only two counties in England— Cumberland and Westmoreland—have no ancient church in his honour. Our county has ten such dedications. Being the patron of cripples, and, by extension, of all beggars, his churches are generally to be found just outside the gates of medieval towns, where such unfortunates were compelled to congregate. In addition to this church there are notable instances at Oxford, Cambridge, Norwich, Northampton and London (Cripplegate). The pre-Reformation altar vessels have all disappeared. In the year 1552 (Ed. VI.) commissioners were appointed to make an Inventory of all the church plate in the kingdom in order that "2 or more challesis or cupps according to the multitude of the people" might be retained, and all the rest were to be "given unto the King's handes to be emploied unto his Highness' use." Unfortunately the inventory for West Bridgford is missing, but it is on record that in the following year (1553) the commissioners handed to Walter Basse, parson of West Bridgford "one chalyce of sylver & p'cell yr off gyldede wt a patents for ye admynystracon of ye holy comunyene, as also thre bells2 of one accorde hangynge in ye styple of ye same churche. It is to be feared that chalice and paten eventually found their way into the melting pot, to re-appear a few years later in another guise. From A.D. 1215 until the Reformation, the cup was denied to the laity and reserved for the priesthood only. In Elizabeth's reign the right of the laity to communicate in both kinds was insisted upon, and so, many an ancient chalice was converted into a Communion cup. Many of these cups bearing date 1571 are still in use, but in this parish there is a paten bearing the hall-mark of 1564-5, which is the earliest in the county. The corresponding cup is unfortunately missing, but it was replaced in 1659 by a cup which probably differs very little from the original one, seeing that the Elizabethan pattern was in vogue for 100 years at least. West Bridgford church. Chancel screen. 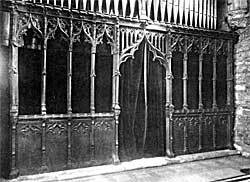 A very fine rood-loft and screen was set up c. 1380. 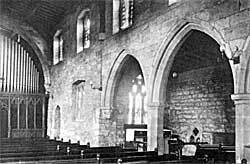 The lower portion was converted into a chancel screen at the Reformation and so remained until 1898. Some curious bits of carving are to be noticed upon it; small heads in the pinnacles of the jambs to the central opening, and enrichments in the cavetto, consisting chiefly of masks and foliage, while the one at the north end depicts a fox with a goose slung across its back; not very cleverly carved it is true, but the idea is unmistakable. When a church contains any grotesques at all, one of them is almost sure to be a fox, either in the guise of a false teacher, or a worldly monk, or as here, in his natural capacity of poultry stealer. As early, perhaps, as the 10th century, a poem appeared ("Reinardus et Isengrimus"), embodying popular fables concerning Master Reynard; in the 12th century a well known Flemish version was published; and thus the Fox became a favourite subject for mediaeval carvers. The crockets on the ogee heads take the form of stiff fleur-de-lys ornaments; they are very unusual in shape, and there can be no doubt whatever that the man who made this screen was not a specialist, but simply the village carpenter; or perhaps it was the village mason, for the work is more in accordance with the practice of a mason than a carpenter. (1) In the modern painted glass on the south side of the new chancel, an arrow is shewn piercing the neck of the hind. (2) It is certain that one, and probably two of this musical sequence of bells are still in use. They will be referred to again later.